Bryson and Christopher both have birthdays in March and they were "big" birthdays this year. Bryson turned 16 and Christopher turned 25. 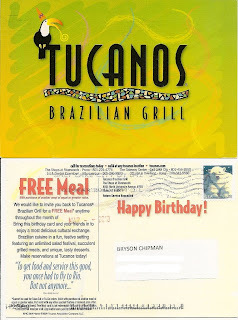 All the siblings decided to get together for dinner at Tucanos, a Brazilian Grill, to celebrate. 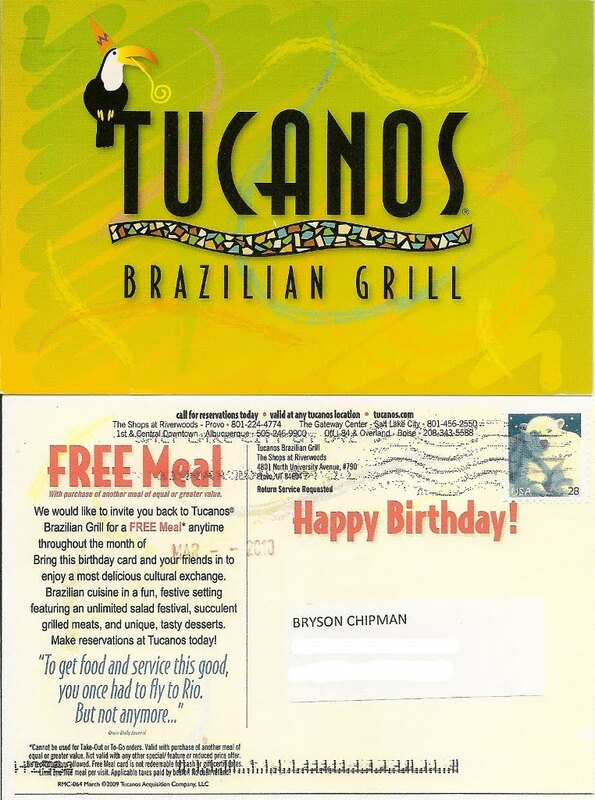 Here's a picture of the Birthday Club card Bryson received. HAPPY BIRTHDAY Bryson and Christopher!! “Wow, you’re good to remember exactly where it was.” I said, when I called back. 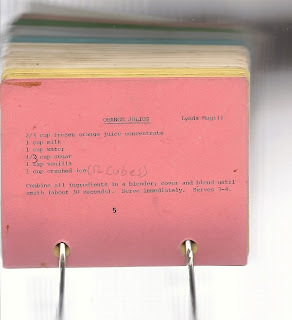 “It was one of the recipes I really enjoyed making while I was growing up.” he said. It must have really impressed him! He hasn’t lived at home since 2004. Bryson decided at the end of school last year that he wanted to stop taking piano lessons. Larry and I weren't very excited about that, but after several discussions with him, agreed to let him do so, once he completed a couple of things. One of those was to earn his 30-point Solo cup. Cups, in Federation Festival programs, are earned by performing in front of 3 judges and receiving a score from 1-5, with 5 given when the piece is performed as closely to perfect as possible. At the end of last summer, Bryson had 29 Solo points, earned over 6 years, which means he had received a 5, or "Superior" rating 5 years and a 4 or "Excellent" rating one year. A score of "1" is given when a student performs poorly, and our kids' piano teacher won't even let them participate in the Festival if they aren't prepared to at least a performance level of 4. Bryson prepared his number, albeit with some foot dragging and grumbling - because he was SURE he wanted to quit piano, went to Festival, received another "5", and promptly quit. Our piano teacher is also a secretary at his high school. Rather than have him come back several months to an awards and recital night after he stopped taking lessons to "present' his cup to him, which he didn't want to do, she brought it to school and he brought it home. So, finally...now...he has his 30-point cup. He plays the piano beautifully. It is a joy to listen to his music, and at times he will also sing along, which we enjoy. he wants to take piano again. Two days before the end of 2009 I was going through some 'saved' memories and came across a white envelope with my name on it written in Larry's handwriting. When I opened it, I found the card and money shown here. There is no date on it, but he and I figure it is about 10 years old. That's how long it has been since Larry has used those cards to write notes to me. Neither of us know why the money was still there, but I decided right then, on the spur of the moment, to plan a date doing something we'd never done before. It only took a moment before I thought of a carriage ride on Temple Square. Checking the web site, I found that the price for a ride during the Christmas season was $50 ~ it was meant to be! Since 4 could ride for the same price as two, and neither Larry and I were in the romantic mood, I decided to ask another couple to join us. First I asked my mother. I don't think she's ever been on a carriage ride and I wanted to thank her for all the hours she has spent at my house for the last several months, helping me in so many little (and big) ways. I called her and explained what we were doing, but sadly, she didn't feel up to it. I called Niki next. I love sharing things like this with my kids. I'd already asked Bryson and he'd said, "No offense mom, but it doesn't sound like a lot of fun as a single guy going on a carriage ride with married people." Christopher and Bri were in California and I knew Dustin was working. It turned out Niki and John could go the next night, which was New Year's Eve. I was so excited!! I asked Bryson to come downtown with us, even though he wouldn't be riding, so he could roam Temple Square and other celebration locations with us, and he agreed, so off the 5 of us went. after parking was to the pick-up spot at the South Gates on Temple Square, since it was a first-come-first-served basis for the rides. I was in my wheelchair, of course, all bundled up snug and warm. great guy! Bryson still didn't want to come, but he was a good sport about it. It was beautiful, as you'll see on the video. And so fun to hear the clip-clop of the horses hooves. Afterward, we did wander around Temple Square for a bit, looking at all there is to see there. We even went inside the South Visitor's Center and the Joseph Smith Memorial Building and partook of some of their activities there. just kept on going, even after the flash went off. We all started laughing. We took a couple of pictures at the tree, but when we got home and looked at them, this was the only one that wasn't fuzzy. We still laugh when we look at this picture, so I decided to include it in our post, even though we have no clue who our "new" family member is. It was the perfect way to get the New Year's Eve celebration started! And it all started with Larry's gift from many Christmas' ago. I made this (4 minute) video from the clips we took during the ride. Hope you enjoy it! Family: Isn't it about time??!!! Bryson has his learner's permit for driving now, he's actually had it for a while - the kids can get it when they turn 15. I was primarily the one who took the older 3 kids out to practice driving when they had their learner's, so I excited to be able to go out with Bryson. This picture was taken the first and last day I took him out on the road. We'd already spent time during earlier days practicing in the parking lot and neighborhood. Bryson did such a good job. I was impressed with his calmness. H really is and will be a good driver. It isn't his driving at all that causes me to stop driving with him. It's my heart. I wasn't really nervous driving with him, but because he's just learning and I was the one teaching him, I had extra adrenaline flowing in my veins - and that made my heart stress out. It calmed down easily once we came home and I was able to take my meds, but there isn't any reason to stress my heart when I can prevent it. Bryson putting ornaments on the tree. Cathi unwrapping bells and ornaments for Bryson to put on display. Just before turning out the lights on Christmas Eve. Bryson's excited to open his gifts. Cathi got a bird feeder that will hang from her bedroom window. and realizing what it was. Bryson gave Larry a gift certificate to Weapon Blender, so Larry could get his own airsoft gun and join Bryson in using them. She said she was still getting used to it - it had only been a couple of hours by the time this picture was taken. We are a fun lovin' family, planning and working to be together - today, tomorrow and forever!